Dissidência (dissent) is the name of the first solo exhibition in Brazil from Mexican artist Minerva Cuevas. Through poetry and film his works highlight the relationship between humanity and the environment, and examine the questions of the protection and commodification of nature, and the rights of people, including native people, and the huge social impacts of the negatives aspects of consumerism and mass culture. 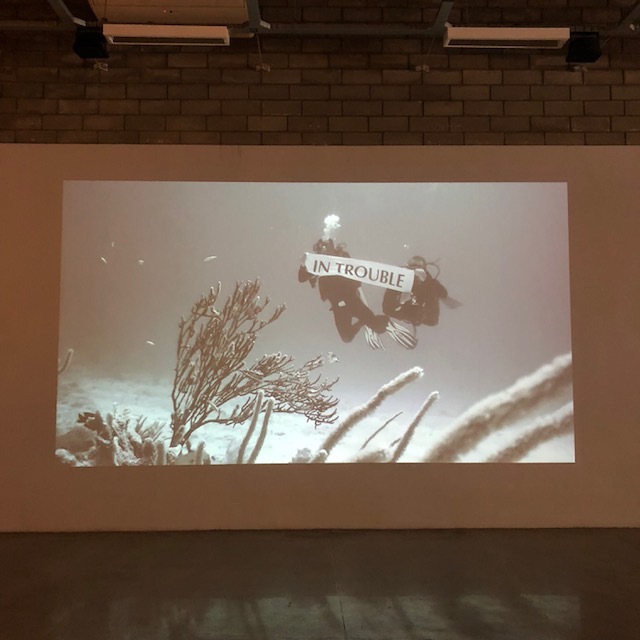 I took the opportunity to visit the exhibition as it is currently taking place at Video Brasil, in my neighbourhood Vila Leopoldina in São Paulo. One of the showcase films is A Draught of Blue, which was filmed on the coast of Akumal Quintana Roo, Mexico. 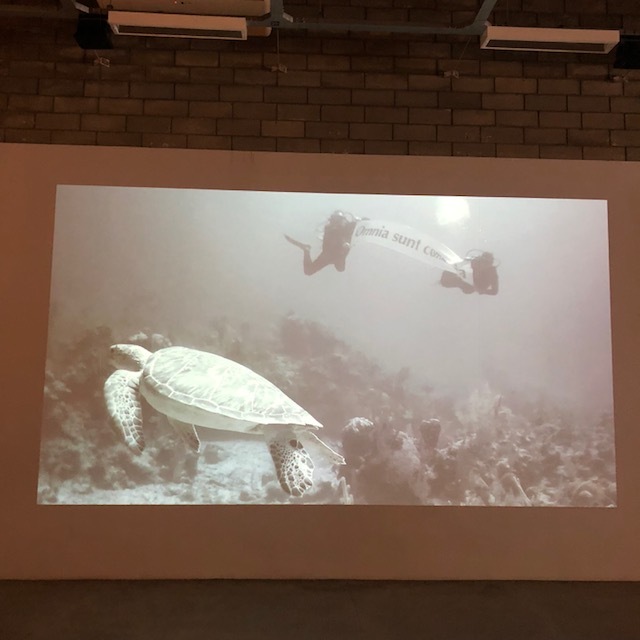 It shows divers swimming in the waters of the Mesoamerican Barrier Reef, which is currently threatened by economic ventures and facing great damage from industrial accidents. Throughout the film, the divers stretch out banners, in the manner of protest marches. 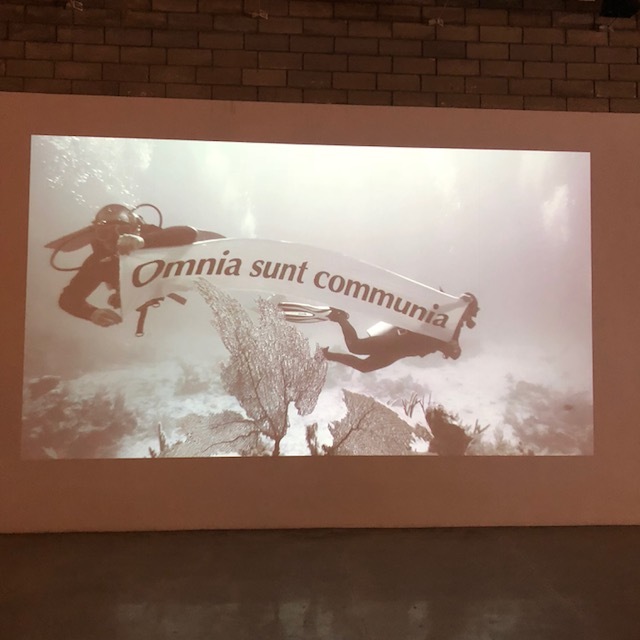 The banner below reads “Omnia sunt communia” [everything is common] which highlights the collective and integral nature of humanity with its surrounding ecosystems. What I liked about the film was that while it is designed to highlight the great damage economic activity is causing to our delicate ecosystems, it chose focus on the beauty and movements found in nature, rather than the actual damage itself. The camera work which of course is not conveyed in these still shots was excellent, following around individual fishes as well as this great turtle. The exhibition comes at a time in Brazil which is seeing ever greater amounts of deforestation in the Amazon, levels of pesticides in agriculture which are not allowed in other countries, large-scale industrial accidents creating widespread ecological devastation, and the reduction of protected indigenous lands. 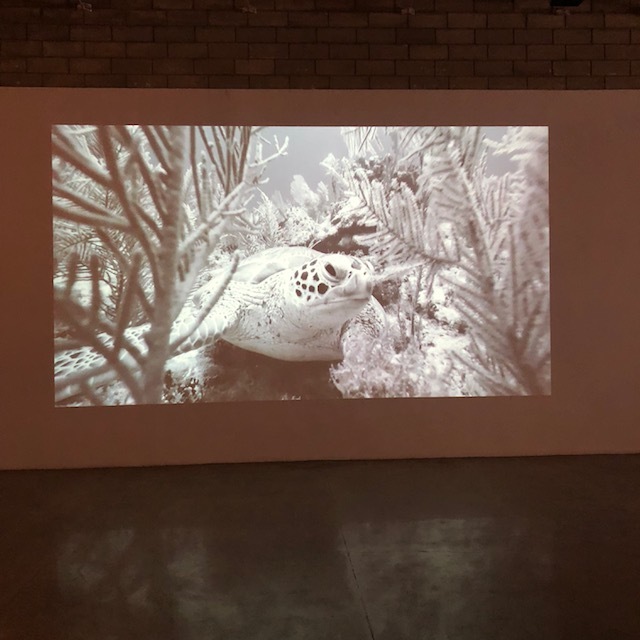 It is therefore great to see Video Brasil continuing to support some of the most innovative and active Latin American artists working to protect both people and planet.